A beautiful day under blue skies, and later under the stars. 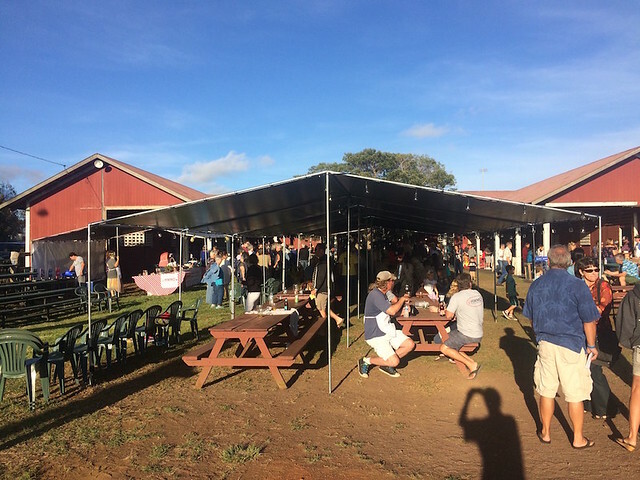 The event attracted people from all over the islands (and some from the mainland, as well) -- over 200 people came to taste chili and have a good time. Parker Ranch was gracious enough to provide a beautiful venue, a historic red barn behind the Rodeo Arena, and lend equipment and volunteers. They also showcased their camouflage brush truck, which the kids had a blast exploring. Big Island Wildfire Coordinating Group serving their dish. HFD Ladder 14 went all out with their smoky decor. Each team cooked their own chili recipes using as many local ingredients as possible. Kahua Ranch, Ponoholo Ranch, and Robby Hind were generous enough to donate meat for the firefighters. With wide grins and flame-filled decorated service stations, the firefighters served the chili to attendees, hoping to win their votes later in the evening. But first, it was up to the legendary chef, Sam Choy, to determine the best chili of the night. The winner? Drum roll...HFD Admin! Their dish won over Sam Choy's taste buds as it was, in his words, the best representation of Hawaiian-style chili (and it was also very delicious). The crowd agreed, too, as they chose the same chili for the People's Choice Award. This is not to say that all of the teams aren't winners in our book -- they all dedicated so much volunteer time to make this event happen and kept our visitors delighted and satiated with their delicious chilis. We also had delectable dishes donated by various food sponsors: vegetarian chili from Tommy Bahamas, rice and sheet cake from KTA, mac salad from Lilikoi Cafe, and cornbread from Mamane Bakery. Spicy Ninja Sauce donated an array of hot sauces at the condiment bar. Beer was donated by Big Island Brewhaus and Kona Brewery, juice was donated by Hemp2o, and coffee was donated by Waimea Coffee Company. Attendees trying the different chilis including Senator Lorraine Inouye (middle, blue). David Tarnas showcasing all of the different chili entries. Miles Nakahara recognized for his years of service to the islands and the organization. Throughout the night, serenading live tunes were performed by Donald Goddard and Widdy Loo, and Jonathan Brooke (of the Pau Hana Pickers) and Richard Griffin. During one of the intermissions, HWMO held a special ceremony for all of the new Firewise Communities, three of which showed up in full force that night: Kanehoa, Waikoloa Village, and Honokoa (Waialea and Puako were also honored, but unfortunately, Firewise Committee members were unable to attend). Kohala Waterfront also came out in numbers -- they are on pace to be certified by the end of the year! Councilman Tim Richards and Senator Lorraine Inouye were also on hand to speak about the importance of wildfire prevention and HWMO's work. We also held a special ceremony for Miles Nakahara who was instrumental in the founding of HWMO and its continued success in the early years.